How much data is published on the web? A lot of. Very much. We share, like, pin and stream something together. Exactly how important the online web is, this infographic shows facts and figures. It is now the sixth edition of DOMO, which collected facts and figures about our online activities. They visualized that in the infographic below. 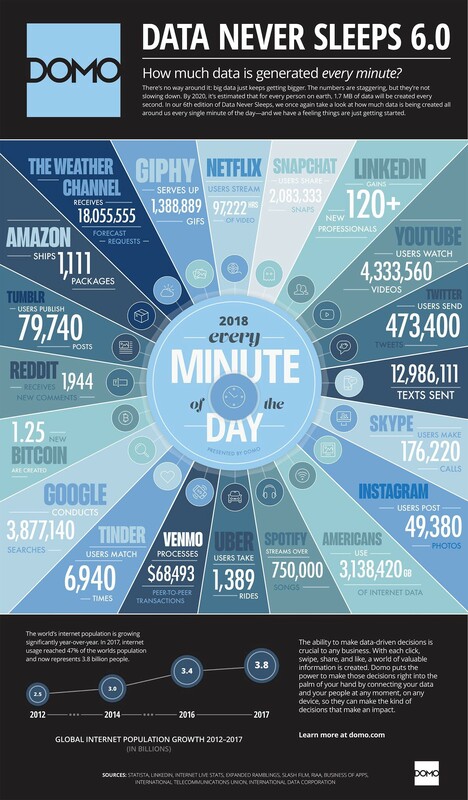 The numbers show what happens online in 1 minute. For example, over four million videos are viewed on YouTube and 473,400 tweets are sent. There are also 176,220 Skype calls. 750,000 songs are streamed on Spotify. We post on Tumblr 79,740 posts and 49,380 photos on Instagram. More than 120 professionals create a LinkedIn profile, on Netflix more than 97,000 hours of movies are streamed and Google processes more than 3.8 million searches. Would you like to know more about the online activities that take place within 60 seconds? Then view the infographic. Click on the image for a larger copy.